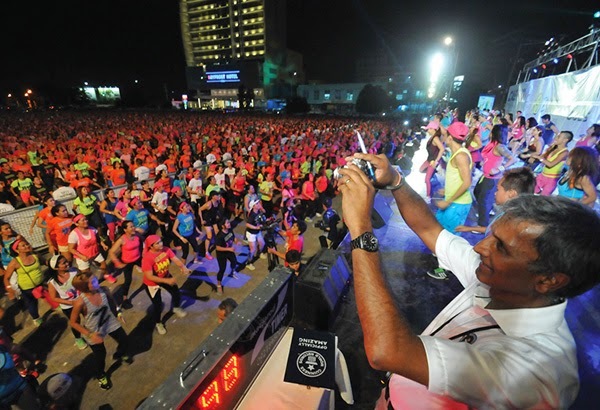 Cebu City is the newest title holder of "The World Largest Zumba Class," according to the Guinness World Records adjudicator Provin Patel. All cebuanos rejoiced after they achieved an extraordinary record as largest zumba class in the world. The current record holder of the largest Zumba class ever held was the India. They have 6,671 participants and was achieved by Dinaz Vervatvala (India) at Peoples' Plaza, Necklace Road, Hyderabad, as reported by Guinness World Records. As of checking the website of GWR, India is still the record holder but they posted a disclaimer stating that the "Records change on a daily basis and are not immediately published online." The Cebu Zumba Class event organizers was the Zumba Instructors Netwok (ZIN) of Cebu. According to the group, the total number of zumba participants on that time, are 8,232 people. The main goal of the zumba dance event was to support the rehabilitation program of the schools classroom repair in Northern Cebu. That was included on the affected area by super typhoon Yolanda last year. The biggest Zumba Dance Class in Cebu city was held at the parking lot of SM City Cebu. For more world records related information, Please bookmark this page for updates and you may also share this post to your friends. Comments or suggestions about "WATCH: The World Largest Zumba Class Record holds by Cebuanos" is important to us, you may share it by using the comment box below.